At the Sheraton Fisherman's Wharf, you'll be taken care of in grand style. Rich mahogany furniture and antique sailing artifacts centered around the lobby fireplace create a welcome place to relax. The 529 beautifully appointed guest rooms, complete with amenities such as high speed Internet access and the Sheraton Sweet Sleeper bed, make you feel right at home. 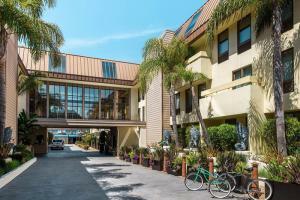 The Sheraton Fisherman's Wharf is located in center of world-famous Fisherman's Wharf, just steps from The Cannery, Ghirardelli Square, Pier 39 and both cable car lines to Chinatown and Union Square. Financial District, Civic Center and the Moscone Convention Center are only 2 miles away via the new MUNI streetcar line. The Compass Grill is open for lunch and dinner, serving steaks, sandwiches, pastas, and fresh seafood. Rounding out the new, globally influenced American fare is a variety of salads and mouthwatering appetizers to intrigue your palate.